WASHINGTON (CNN) -- The U.S. Senate confirmed Eric Holder as attorney general Monday, voting 75-21 to place him in charge of the Department of Justice. Eric Holder is a former federal prosecutor and served as deputy attorney general during the Clinton administration. 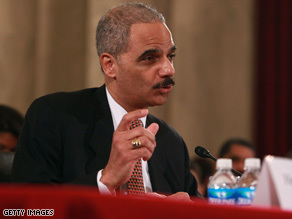 Holder, 58, is a former federal prosecutor and served as deputy attorney general during the Clinton administration. His confirmation makes him the first African-American confirmed to the post, though he held the job on an acting basis in early 2001. Monday's vote leaves him set to take over a Justice Department battered by a series of controversies during the Bush administration, from questions about how it laid legal groundwork for harsh interrogations of suspected terrorists to the sackings of top federal prosecutors in several cities. During confirmation hearings, Republicans questioned his role in former President Bill Clinton's widely criticized last-minute pardon of fugitive financier Marc Rich and questioned whether he would be independent of the White House. Holder had a testy exchange with the Senate Judiciary Committee's ranking Republican, Arlen Specter, who questioned Holder's "fitness" for the office. Judiciary Committee Chairman Patrick Leahy pointed out that the chamber's Republican membership backed Bush administration Attorney General Alberto Gonzales, who was forced out in late 2007. The GOP also did not condemn the former president's commutation of the prison term facing ex-White House aide Lewis "Scooter" Libby, who was convicted of obstructing justice and lying to federal agents probing the 2003 disclosure of a CIA agent's identity. "I don't recall any Republicans objecting to that," said Leahy, D-Vermont. "Instead, they're objecting to something President Clinton did. I don't want to suggest in any way that the objections are partisan, but they certainly aren't consistent." Bond, the ranking Republican on the Intelligence Committee, raised concerns that the administration would seek to prosecute U.S. officials involved in using what the Bush administration called "alternative" interrogation techniques, measures critics said involved the torture of prisoners in U.S. custody.